By Reina in Who We Are on October 21, 2016 . I have been brought up around flowers ever since I was born because my parents work at flower shop. Every day I have seen flowers, so I like them. 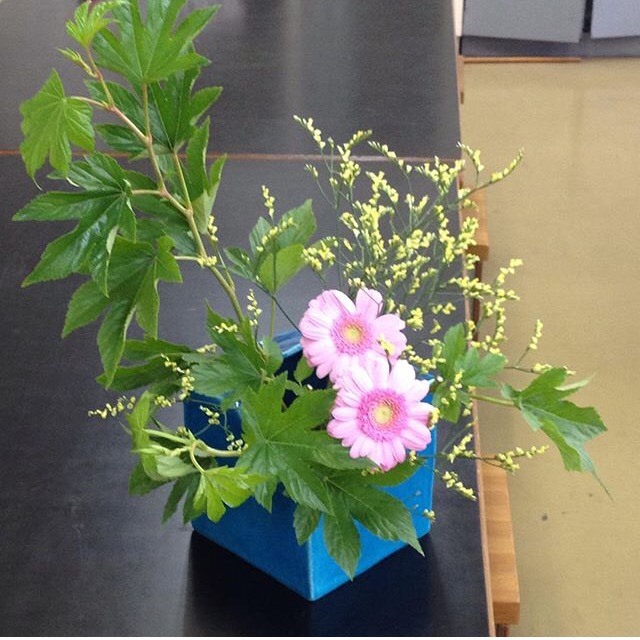 When I entered high school I started doing ikebana. My hobby is ikebana, so I’m in the tea ceremony and flower arrangement club at HUEA. I’ve been doing tea ceremony for three months. Our main activity is making tea, but we also do flower arrangement once a month. Doing flower arranging costs money, because we have to buy flowers. It probably costs about one thousand yen for one activity. We decide which days of week every month. For instance, this month we did it on Wednesdays, but last month we did on Thursdays. The tea ceremony and flower arrangement are traditional parts of Japanese culture. To tell the truth, you are supposed to wear kimono during these activities, but in my club we don’t! So if join us, you don’t worry about the clothes. You can come to our club wearing casual clothes. You don’t also worry about bringing the tools for flower arrangement. For example, flower shears, flower organ and something else. We do our activities on campus at the サークル会館 of HUEA. If you join this club, please contact me, Ayana Ozono, my club leader, or go to 学務グループof this university and tell them you want to join it. Right now, we don’t have foreigners including exchange students, but we would gladly welcome you.